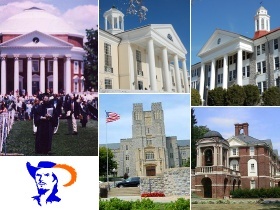 Clockwise from top left: The Rotunda, Univeristy of Virginia; Hunt Hall, Mary Baldwin College; Wilson Hall, James Madison University; Gray Hall, Sweet Briar College; Burruss Hall, Virginia Tech. Ph.D. in Foreign Affairs, University of Virginia, Charlottesville, VA, January 2002. Passed comprehensive exams in the subfields of international relations, foreign policy analysis (U.S. and Latin America), comparative politics, and American national institutions. M.A. in Economics, American University, Washington, DC, May 1984. B.A. in Economics and Political Science, University of South Dakota, Vermillion, SD, May 1978. Minors: Spanish and Business Administration. August 2015 - present: Visiting Assistant Professor, Sweet Briar College, Sweet Briar, VA. Am teaching Comparative Politics, U.S. Foreign Policy, Latin American Politics, and Seminar in International Affairs. Previously served as Adjunct Instructor, August 2007 - May 2008, August - December 2013: and January - May 2015, having taught International Politics, East Asian Politics, and Theories of Comparative Politics, and others listed above. January - May 2015: Adjunct Instructor, Bridgewater College, Bridgewater, VA. Taught Latin American Politics. January 2009 - May 2015: Adjunct Instructor, Central Virginia Community College. Taught U.S. Government, and in five years led field trips to the State Capitol in Richmond Virginia. August 2003 - May 2004: Visiting Assistant Professor, Department of Political Science, James Madison University, Harrisonburg, VA. In fall term taught two sections of Global Politics (with 110 students), as well as International Relations (including a diplomatic simulation with negotiations among 35 participants, conducted in class and via e-mail). In spring term taught two sections of Global Politics again, plus Latin American Politics. I produced a video of highlights from the trip my wife and I took to Peru during spring break, and showed it to class. January - May 2002: Adjunct professor, Mary Baldwin College, Staunton, VA. Taught Comparative Politics (refining and developing the Web site created at Virginia Tech) and a colloquium in "Third World Security Issues." January to July 2001: Visiting adjunct professor, Department of Political Science, Virginia Polytechnic Institute and State University, Blacksburg, VA. Taught two sections of Comparative Politics (with over 400 students) in the spring term, as well as Latin American Governments and Politics. Developed a comprehensive Web site for Comparative Politics (no longer on line), including maps, photos, timetables, and other study aids. Taught Comparative Politics again in the summer term. August 1999 to May 2000: Adjunct professor, Department of Political Science and Public Administration, Virginia Commonwealth University, Richmond, VA. In fall term taught International Relations (including a diplomatic simulation with negotiations among 80+ participants, conducted in class and via e-mail). In spring term taught Latin American Governments and Politics. American Political Science Association annual meeting, Washington, DC, August 1993. American Political Science Association annual meeting, Washington, DC, August 1996.
International Studies Association (Southern Region) annual meeting, Roanoke, VA, October 1996. Presented paper: "Normative Realism and International Political Economy: A Neglected Link?" American Political Science Association annual meeting, Boston, MA, August 1998. Presented paper (in poster session): "Modelling Foreign and Economic Policy as Effects of State Building." American Political Science Association annual meeting, Washington, DC, August 2000.
International Studies Association (Security Section) Annual Conference, Carlisle Barracks, PA, October 31-November 1, 2003. Presented paper: "Fighting Terrorism and Protecting Civil Liberties: Some Lessons From Peru." A Study of Political-Economic Adaptation and the Autonomy of Emerging Nation-States, With Special Reference to Peru"
by Andrew G. Clem, University of Virginia, copyright 2002. All rights reserved. This dissertation inquires into the adaptive strategies employed by emerging nation-states seeking to establish sovereign governing authority by asserting national autonomy. Specifically, it explores the interaction between foreign policy and economic policy, and the joint effect of these policies on governability, in Peru and five other medium-small less developed countries. As a unique contribution to the state-building subfield of historical political economy, it specifies precise policy linkages based on a review of theories from the respective fields of international relations and macroeconomics. It then tests two hypotheses based on opposing conceptions of the international system: anarchic (a "sink or swim" context in which constraints on policy are rigid) vs. hierarchic (allowing for varying degrees of state consolidation and policy choice). With regard to the first hypothesis, I find some evidence of a predicted affinity between defiant (militarized) foreign policies and heterodox (statist) economic policies on one hand, and between orthodox (open-market) economic policies and compliant (pacific) foreign policies on the other hand. The evidence is somewhat stronger in favor of the second hypothesis: Countries that adopt a non-competitive heterodox-compliant strategy are prone to suffer an erosion of state authority, while those that manage to sustain an ultra-competitive orthodox-defiant strategy for many years tend to achieve the most success in state building. Based on an in-depth examination of decision-making processes in Peru during four successive governments from 1968 to 1990 (based on thorough primary research on Peru, including interviews with a number of former top officials), I find that failures by leaders to promptly adjust their foreign and economic policies in response to changing external conditions usually leads, perforce, to an extreme reaction in the opposition direction. I contend that these abrupt, awkward policy oscillations reflect the "existential predicament" faced by emerging nation-states: their struggle to survive by competing with the outside world is "smothered" by international norms that were originally created to facilitate cooperation among great powers. Given the razor-thin margin for policymaking error in an era of globalization, I conclude that we should expect a continuation of periodic regime crises in the Third World, and even outbreaks of international conflicts. Is essential to encourage research and new discoveries. Is a privilege that must be earned. Can be abused unless there exists effective peer review. Is inherently controversial because of the hazy line between academic and non-academic pursuits.